Barbie can now add game developer to her extensive resume. As Mashable reports, a tech-savvy edition of the iconic doll is now available to purchase. Earlier in 2016, Mattel announced they had chosen game developer to be Barbie's newest "Career of the Year." In the past decade alone, Barbie has held the title of film director, entrepreneur, and astronaut, and while her latest gig may not sound as glamorous, it is well timed: Eight of this year's top 25 jobs are in tech, an industry that's still overwhelmingly male. With Barbie's latest profession, Mattel hopes to "open young techies to the world of game development." Barbie has come a long way since previous attempts to depict her as computer literate. The 2013 book Barbie: I Can Become a Computer Engineer received serious backlash for only having Barbie create the designs for her game while her two guy friends did the actual programming. Mattel's Game Developer doll is part of a recent shift for the company toward making Barbie a more relevant role model for modern girls. A few months ago, they began releasing dolls from their most diverse line ever, which includes three body types and seven skin tones. 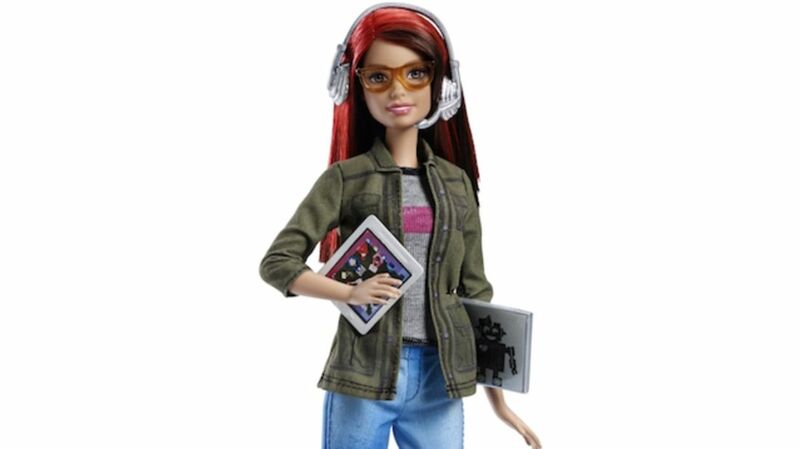 The newest Barbie, complete with a headset, tablet with the game she's working on, and laptop with real coding graphics, is now available online for $13.